When we think of Buck lockbacks, our first thought goes to the 110. That’s the knife that launched a genre, and started thousands on their journey as folding knife collectors. 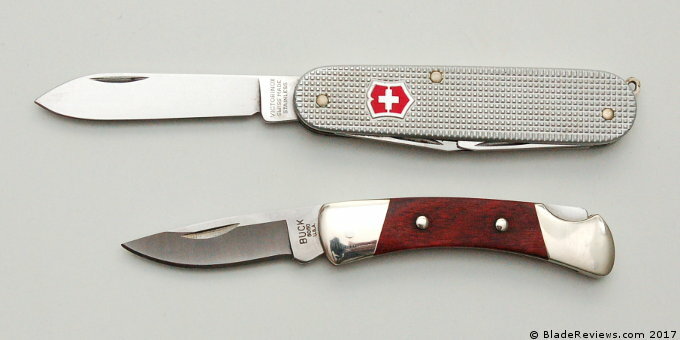 The 110 remains one of the most iconic and popular folding knives today. At least on paper. In practice it’s a bit of a boat anchor, and by today’s standards you can see that we have come a long way from the 110. If you are looking for some of the old school charm of the wood and bolsters of the 110, but want something more practical, then I think the Buck 505 “Knight” may be a better option. The 505 shares the 110’s aesthetic, but is a fraction of the size. It’s slim, light, yet polished up enough to wander into gentleman’s folder territory. And it’s also well under $50. Frankly I was surprised to learn about this knife, and picked up after a reader asked me to review it. I figured it would have come up more in the circles I frequent. At any rate, the 505 shall be a mystery no longer, and I look forward to sharing a review of this sleeper blade with you today. The Buck 505, aka the “Knight” has an overall length of 4.6″, a 1.875″ blade, and weighs 1.35 ounces. The Knight is made in the USA. The 505 Knight is one of the smallest knives in my collection. It’s tiny, even when compared with my Spyderco Dragonfly. It may be too small for some, or relegated to the role of a backup knife. Still, it’s a capable little blade and has performed admirably as an EDC knife. The 505 has a simple drop point blade with a high hollow grind. It is simple with a belt satin finish. The tip is not particularly fine, and when they put the edge on this knife they bumped the plunge line with the belt grinder. The edge is almost a continual belly. It has been neatly applied, and came razor sharp from the factory. Predictably this knife comes in Buck’s 420HC steel. I was actually pleasantly surprised with how this little knife cut. It still shaved hair after breaking down a good size cardboard box. It does fine with opening letters and packages, slicing fruit, and performing other light duty EDC chores. I have been able to maintain the edge with light stropping. Maybe that Bos heat treat is more than mere marketing. The 505’s handle is made of stainless steel. There are no liners, and the handle is milled from 2 slabs of steel that sandwich a stainless steel backspacer and lock bar. Stabilized Rosewood handle scales are riveted on. Handle construction is simple but solid. The bolsters and rivets have been buffed to a high polish, and the transition between the scales and the bolsters is baby bottom smooth. The end result is a knife with gem like qualities. This attention to detail elevates the 505 from humble tool to more of a more refined piece. The downside to such a small knife is you have less to grip onto. With the 505 you are afforded a 3 finger grip, maybe a 3.5 if you choke up onto the blade. However, you can still get a lot done with the Knight. I have no issue breaking down boxes, cutting string, and using the 505 for other light duty tasks. 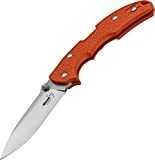 I wouldn’t recommend the knife to a rancher or police officer, but the 505 makes for a capable backup knife, a light duty EDC, or even a gents folder. Although it would spoil the lines, I can see the advantage to having a lanyard hole on this knife. It might make the 505 a little easier to retrieve from the pocket and provide something for your pinky to grab onto a la the CRKT Minimalist. That said, I’ve never been a fan of lanyards on folding knives, and I don’t miss having one on the Knight. There is no pocket clip on the 505, so I can only comment on how this knife carries loose in the pocket. The Knight is the kind of knife that disappears into the pocket. That should come as no surprise as it’s a slim sub 2 ounce knife. You may want to consider carrying the 505 in a slip sheath if you can find or make one small enough. Another option could be or carrying the 505 in the coin pocket of your jeans. This is traditional lockback, and the 505 comes with a nail nick to open the blade. It’s a generous nail nick, and that combined with the saber grind gives you plenty to grip on to as you grip the knife. The backspring is mild. There is no chance of the knife opening accidentally, but it won’t take much effort to manipulate the blade open either. That same mild backspring makes the lockback mechanism easy to disengage. The tab is placed at the very end of the knife, so there is no danger of accidentally releasing the blade in your hand, but when you are ready to close the 505 it will not be a chore. Lockup is tight and free of blade play. The 505 performs just like you would expect from a good lockback. Blade centering is perfect on my example. The 505 Knight may be the surprisingly good little lockback that you have never heard of. Or maybe I’ve been living under a rock. Regardless, I am glad I came across the 505 as I think it represents an interesting value proposition. 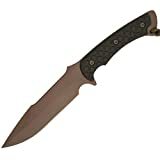 This is a more practical alternative to the 110 for the urban EDC crowd, and is an all around nice knife. The biggest potential issue is whether the 505 swings too far in the opposite direction of the 110. While the 110 is a big and bulky knife, the 505 is diminutive. It is probably the smallest knife I have reviewed. You can’t get a full 4 finger grip on it, and the absence of a pocket clip or lanyard hole increases the likelihood of misplacing the knife. Personally, I haven’t been bothered by the small size, but there are limitations to the 505 and they may be too great for you to seriously consider this as your daily carry. In that instance the 505 may still be appealing as a backup EDC option or a dress knife. Another option may be to jump up to the 501 Squire or the 503 Prince. There aren’t any particularly good size comparisons on these knives, but here is a link to an old BladeForums thread with some pictures and opinions. Maybe I need to pick some up for a proper comparison? For under $40 you get a solidly built folder that is made in the USA and nicely finished. The cutting performance is surprising given the 420 HC steel. That said, the Knight is not perfect. I wish a little more care was taken when they put the edge on it, but for the money I’m not sure I can complain. And the handle construction and performance make up for it. I say buy it if you like it. 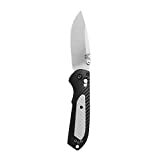 I recommend purchasing the Buck 505 Knight at Amazon. Please consider that purchasing anything through any of the links on this website helps support BladeReviews.com, and keeps the site going. As always, any and all support is greatly appreciated. Thank you very much.